Where do A New Chance dogs come from? We rescue dogs from high kill shelters and other dangerous situations, both in the South and locally. What kinds of dogs does A New Chance rescue? We rescue all kinds of dogs: big, small and medium sized; shorthaired, longhaired, and sometimes even hypoallergenic; and all with different personalities. Though the majority of our dogs are mixed breeds, we do occasionally get purebreds as well. And of course, many mixed breeds look predominately like a certain breed. Fostering is when a family opens their home and heart to a rescue dog and keeps that dog until it finds its forever home. Their job is to begin the training and socialization process with the dog so that s/he can be successful in his/her adoptive home. By seeing how the dog reacts to the activities of daily life in a real family, A New Chance gains a much better sense of the dog’s personality and is better able to match that dog with an adoptive family. 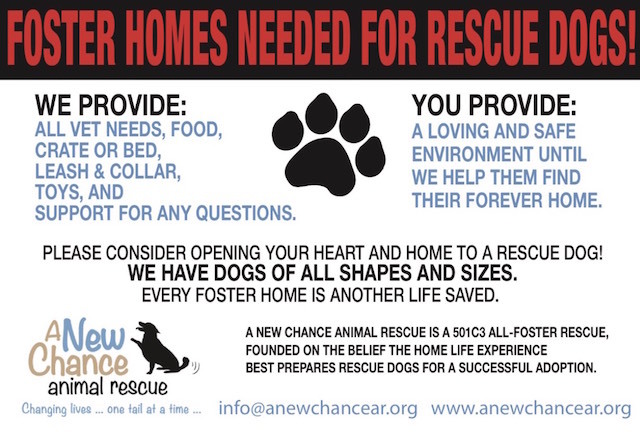 A New Chance does not have a physical shelter to house our dogs and relies entirely on foster homes to do so until they are adopted. We can only save as many dogs as we have foster homes for; every foster home is another life saved. Foster homes expose the dog to the activities and situations that will normally be experienced in his/her forever home in a way that shelter life cannot. How long does a foster last? Most fosters last about 3 weeks, though they can last anywhere from a week to a few months. It is impossible to know this in advance as the variable that determines when a dog is adopted is when the right home is found. Can I pick my foster dog? Unfortunately, we cannot allow foster homes to pick their foster dogs because we need to ensure that foster dogs are matched with the appropriate foster home. However, foster homes are asked to provide information on what parameters would work best for them and then, our foster coordinator matches dogs accordingly. What if I want to keep my foster dog? We understand that sometimes you just fall in love with a dog, so foster homes have a week to decide if they want to adopt their foster dog. We prefer that if you keep a dog, you continue to foster because if we lose a foster home, then we lose another dog to euthanasia. What happens if a problem arises? A New Chance has volunteers available to answer questions at all times. We also have professional trainers available to work through difficult situations with foster homes, if needed. While we prefer to work through any issues, we, of course, can take a dog back at anytime if it’s not working out. What if I no longer want my foster dog? We prefer that people keep their fosters until they are adopted because it is very stressful to move the dogs from home to home, but if the foster home needs to give the dog back, we will make arrangements for them to do so. How do potential adopters find out about my foster dog? We list all adoptable dogs on Petfinder, a nationwide website dedicated to helping dogs up for adoption find homes, and on our website, anewchancear.org. The first step to becoming A New Chance foster home is to submit the Foster Application. Once you have filled out the application completely, we will review it and determine whether you would be a good match for our foster program. We will then get back to you regarding the status of your application. If approved, our foster coordinator will work out the further details with you. All foster families are required to sign a Hold Harmless Waiver. This is an amazing article that captures the essence of fostering. It’s not just a gift for the dog you save, it’s a gift for yourself. They open their houses and hearts to fall in love with a dog that they know isn’t theirs for keeps. They go to work providing crate and leash training, socialization, medication and extra meals as needed. They separate resident pets from foster dogs if they have to, scoop extra poop, write blogs, take photos and spent their weekends at adoption events. They take on all of the work that comes along with bringing home a new dog, and then some. They do their best to balance holding tight and letting go. It is a tricky dance to care so deeply for a guest, since dogs stay forever in our hearts. But when people tell them, “I couldn’t foster because it would be too hard to give the dog up.” They say, “How can it be harder than knowing a dog died because no foster home stepped up?” And that is why they do it time and again. And while they worry they might not be strong enough to let this one go, something special happens: The right adoption application arrives! They lifted a single soul up, out of the crowd and floating on their hands, their foster dog arrived in the arms of the family that has been searching for him. It was all worthwhile. They are the specialists, the deep sea divers, working the details of a dog’s life until he’s ready for prime time. They bridge the gap to a new life. They are foster families – true everyday heroes. And sometimes, they are the bridge to somewhere deeper, a place to rest.